Apple Mac OS 10.8 Mountain Lion, Mac OS 10.9 Mavericks, Mac OS 10.10 Yosemite. Microsoft Windows 7, Windows 8/8.1, Windows 10 (Classical view only). The installation footprint is approximately 125 MB. A minimum 1GB MB RAM is required. Minimum 1 GHz; however, 1.5 GHz is recommended. Intel Pentium 4 at a minimum, dual core CPU at a minimum is recommended for video calls. 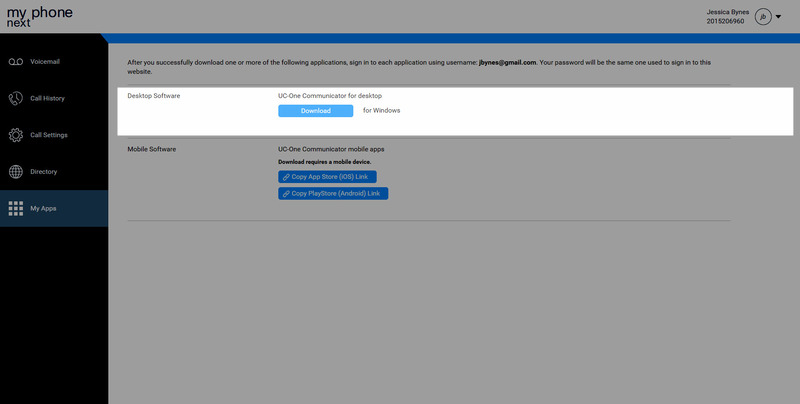 You will receive an email indicating you were given access to the Desktop App. Click the My Apps tab . Click Download for the Desktop Software. The first time you launch the Desktop App you are prompted to select a region before you sign in. If you are updating the app, the Region selection should already be in the system. You can choose to sign in automatically after initial sign in. You must also verify your address that reflects your current location for 911 calling. Enter the user name and password for the Desktop Softphone. Immediately after sign in, the Outlook Integration pop-up appears informing you that you can search Microsoft® Outlook® contacts and calendar events to incorporate into the Desktop Softphone. You can change these settings later in Preferences. This feature enables Microsoft Outlook to display Desktop contact presence and allows you to invoke Desktop functions like Chat, Call from Computer, Call from Phone, and Video Call from within Outlook. Click Yes to search for Outlook contacts and calendar events. The contact list will be empty when you launch the Virtual Communications Express Desktop Softphone for the first time. Use the search field to find people and add them to your contact list. Contacts can also be added by clicking the + (add) button. Presence – Indicate whether you are available, away, busy, or offline. You can also set your location. It also indicates if you are offline, on a call, or in a meeting. 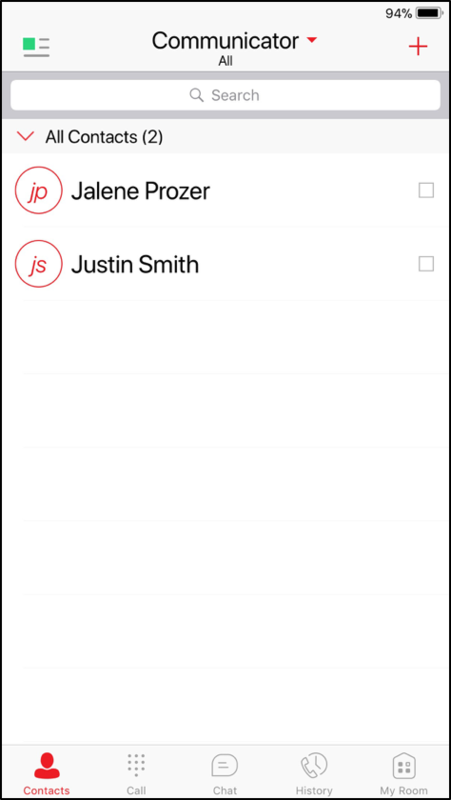 Contacts – View your contacts. Use to filter and add contacts. Chat – Allows you to view recent chat communications with contacts and continue those chat conversations. Communication History – View messages and access voice mail. Dialer – Open a dial pad to place a call. Hub is an add-on which provides contextual data and MicroApp integration for the UC-One Communicator (Desktop). With the addition of Hub, Communicator Users can add Micro App integration with Contextual information sharing. This allows Users to not only access all of their required information from a single User interface, but also, to view shared content specific to the person they are communicating with. Click on the Hub icon to view available integrations with the Desktop Client. Toggle the desired app integration to On and follow the sign in steps for that app. By adding Virtual Communications Express Mobile to a Google Android or Apple iOS platform, you can leverage a convenient and intuitive interface for mobile calling services. Calls look just like a call made from your business desk phone. Receive calls on your mobile phone as if it was your desk phone. One-button business voice mail access. Access your business enterprise directory from your smartphone. Go to the Google Marketplace or the Apple App Store and search for Virtual Communications Express to download and install it. You will be prompted if you would like to receive notifications from the client. Click Allow to receive notifications or Don’t Allow if you would not like to receive these alerts. Enter your Mobile Client Username and Password. The Username can be found in the My Phone dashboard in the My Features tab > Mobile App and/or UC-Tablet. Select Show Password to view the password as you type. Check Remember Password, if applicable. 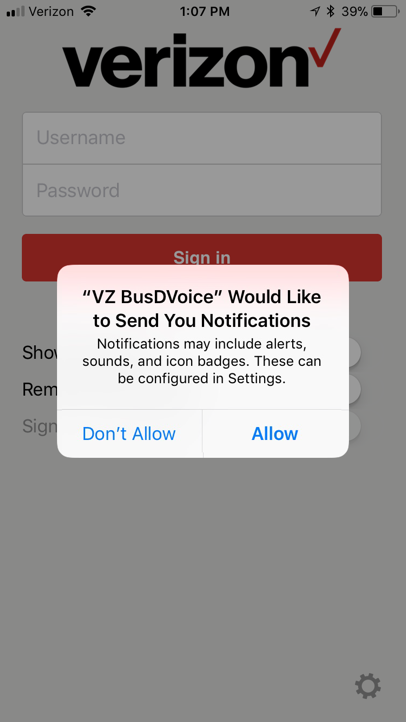 Upon sign-in, the App will prompt you to select if you would like it to access your Contacts. This will allow you to dial the Contacts saved on your device from the Directory Tab within the App. Upon sign-in, the Contacts Tab is displayed. If you’ve added Contacts via your Desktop App, they will appear in your Contact list here. You will want to configure some basic call settings and preferences for your mobile/tablet clients. Tap the Availability icon in the upper left to open the options window. 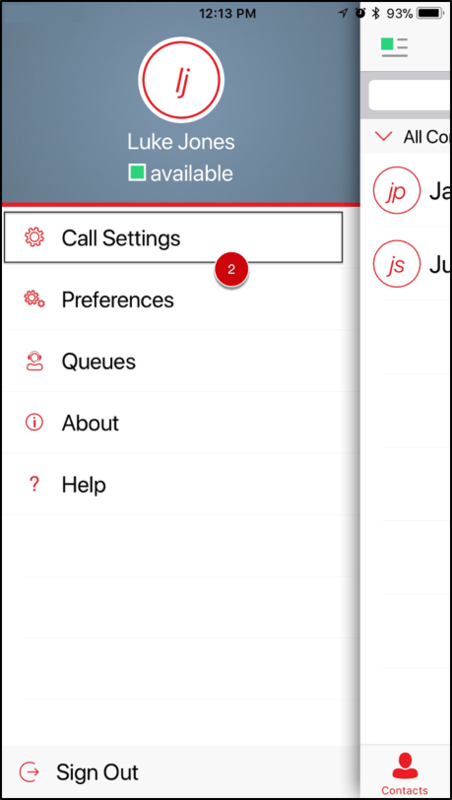 Under Call Options, when placing outgoing calls, you can choose to be prompted for how you prefer to place the call. This determines if your call will be placed over the cellular network or as a VoIP Call, using your wifi/data plan. The Dialing Service is configured to Always Ask by default, though VoIP Call is the only other option. Tap VoIP Call to enable it. This will place your calls using your Wifi/data and will display your Business Identity. 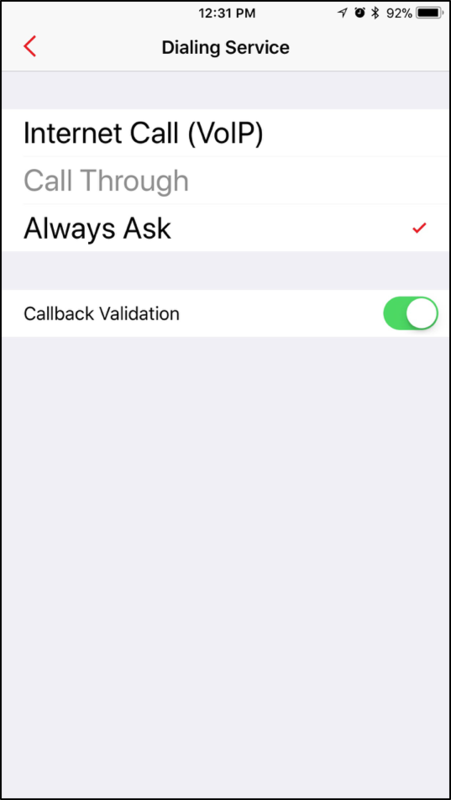 Callback Validation will send a call to you on your configured phone and then connect you to the person you called. To enable, toggle Callback Validation. When placing VoIP call you can also choose to use Wifi Only or Use all Networks. The Mobile Number/iPhone Number setting displays the phone number of your device. 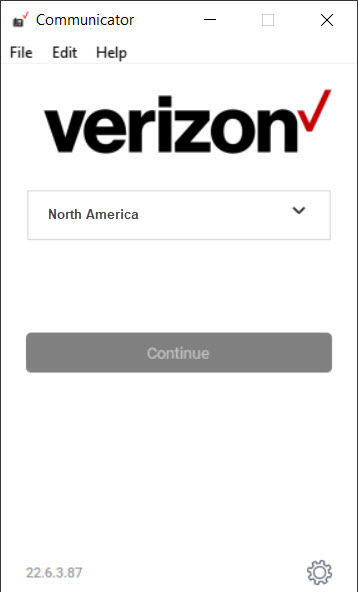 By default, this field is empty, so you will need to populate it with the phone number associated with your mobile device.